We are located in the Fortaleza street, the main street of the old San juan, so that you will be surrounded of a lot famous, legendary and beautiful places. In our street you will find places like the famous Pirilos Pizza, Barra China rest., where the pina colada was created and few restaurant of puerto rican, indian, asian food, etc. You would find too realy good souvenirs and art stores and historic places like the colon square, the pigeon square and in the end of the street you can view and visit one of the most beautiful and ancient fortifications of Old San Juan, the fort, now home of the governor of Puerto Rico. 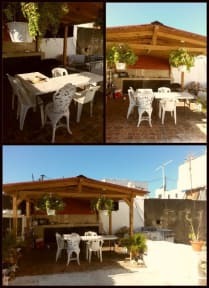 Fortaleza guest House got few common areas like kitchen, living rooms, bathrooms; We got a beautiful terrace where you can sit and enjoy with your family or friends of the warm weather of Puerto Rico or make a delicious launch because there is another kitchen under a rustic roof. Also we have two souvenirs and gift shop for your convenience: Recodo Caribbean and Family Super Store, If you ask for it we will give you a 10% less of the total of your purchase. 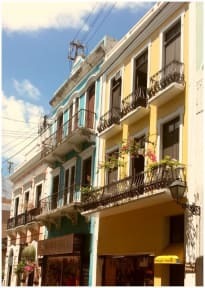 There are just few budget options in Old San Juan, so Fortaleza Guesthouse is a precious chance. It looks rather oldfashioned, but don't be scared: it is clean, beds are comfortable, facilities work well, and the ever present owner helps you in every occasion. Don't expect a great atmosphere, it is just a calm accomodation. Free wifi works very well.